The coming of Spring at Aunt’s. It has been a long, cold winter this year, and March has left like a lion, rather than a lamb. But spring has arrived, at least enough for some action in the ravaged front garden of Aunt’s. The background of this shot is one of the tree stumps of (wild) trees that Aunt allowed to grow up and become a menace. 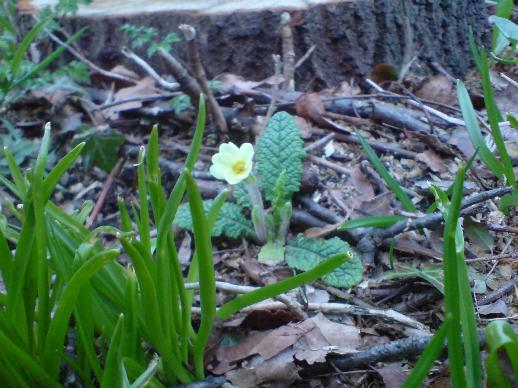 And, in front, the welcome flower of Primula Vulgaris, the common primrose. I don’t know if this is a genuine wild plant, or a cultivar of the wild plant. Bulbs are also showing, and even the hellibores, cut down in their prime, are showing again, but get trodden on every time brother or I reverse our cars so as to load up and haul away. Meanwhile, at Mother’s. there are the first signs of life. The white daffodils, always the last to flower, are in bud. In the greenhouse the red cowslip has started to flower. I had been invited to a “meet” this evening, of car enthuiasts. 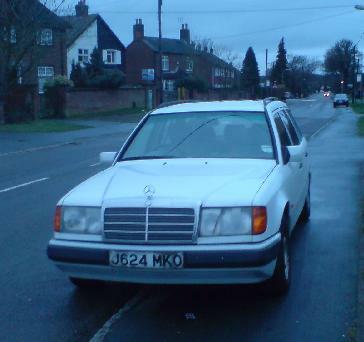 One reason was my “new” MB, and the unbelievable coincidence of the registration. Indeed, this picture was deliberately posed, after colleague and I had driven in convoy from my place to this pub in Esher. I’m now a member of the Mercedes-Benz Club, the oldest such club there is (older than any in Germany), and recogised by Daimler Benz. In the “meet” was the Gazette editor, a few others I had also met before at colleague’s 50th birthday surprise, and one of his particular friends who had helped me out on Saabs on various occasions, but a current Skoda owner. So one of the photos taken is likely to appear in the Gazette, along with text from one or both of us about this incredible find. On two occasions I had driven colleage’s car (following his 170VB MB to Sandwich and back), and that was because his car had a tow bar, and the Saab did not. Apart from a heart-attack when I could not get the thing to accelerate to overtake (the “kick down”), it was a pleasant drive, and one reason to purchase such a car. But on this occasion, driving in convoy to the pub (if I had realised which pub it was, I should have taken the lead, so the convoy was in order) I found his driving hard to follow. I had to move my auto in “S” (Sport?) in order to leap into junctions behind his diesel MB, rather than the “E” (Economy) I normally run in. Following is definately more difficult. Yesterday was quite an adventure. 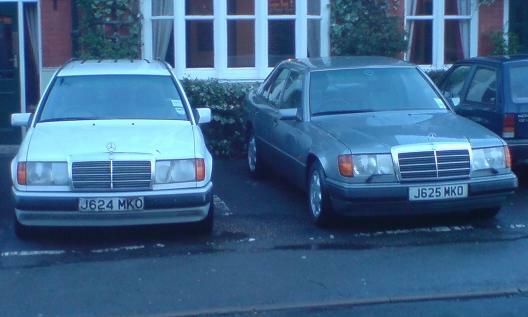 I discovered that there were two W124 Mercedes Benz for sale at a garage in W London, and my colleague, a W124 owner himself, volunteered to come along. To say he is an expert is to understate it. I had already arranged a viewing next Tuesday, for another, but this was just a look around. The first one proved to be a total dog of a car. We could not even get into the driver’s door. This was the car the dealer hinted was the better. It was in a bad way. Things looked bad. No test drive, we went back. This time we were assigned a teenager to watch us, as the car was parked 1/4 mile away. I got the keys, and uttered an oath; My colleage, wondering what on earth made me do this asked for the keys, and too suddenly uttered oathes. For we were about to meet the car one digit difference in registration number to his car. Registered to the same garage in Kent 19 years ago moments before his one. So this tired old MB already had one lucky break; The next was to have this MB expert who I let test drive (for he would know what to expect). At one point the dealer phoned up the teenager, who said we were on test run (that must have surprised the garage! ), and it passed. OK, it needs a lot of tlc, and some more serious work. The first was a drive belt, which I had to buy from MB spares this morning. To say my fame preceeded me put it mildly; an email from my colleague (a regular there), and the service I had was amazing, including a discount! Not that the parts were expensive in the first place. Then to his place, when the cars met nose to nose; if cars could talk, (viz the trains in the Rev Audry’s stories), one can imagine their mutual surprise, and colleague’s MB telling my MB that if it behaved all would be well. Just like the Audry story, “Old Iron” (one of the four in “Edward the Blue Engine”). Photo was taken outside Aunt’s house, after the first major journey I’ve taken in it. It being Mothering Sunday, and as she had not been out of her house for months, unless a hospital or day centre, I decided to take Mother for a run out. Now that my Saab is dead, it was a hired Toyota Aygo (“I-go”, I assume). First, I took her to see what is now her second home, that is, what was Aunt’s place and left to her. Not to view inside (that is still a complete mess), but just the outside with all the wild trees cut down etc. I wonder if the arrangement when the two sisters inherited the place from their mother was that Mother would inherit the lot for giving Aunt the living in it; or she gets her half back with interest in the form of the other half. There is nothing official, Aunt’s is the only name on the deeds, but there is no evidence that Mother brought anything other than one antique from that house – I really doubt any cash from a mortgaged house to get her share of their mother’s inheritance. Anyhow, after the view, I continued down the hill and onward for a short trip around S Bucks/Berkshire, a different route to many taken recently. 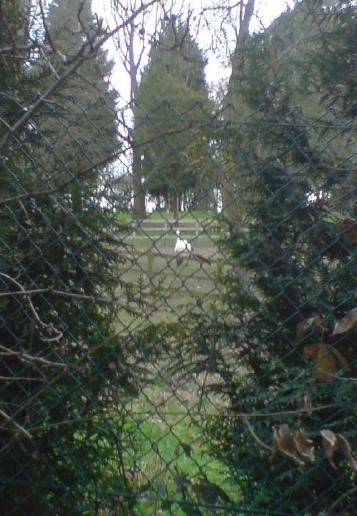 But part way down the hill I caught a glimpse of what I thought was an ostrich!. So, on the way back I briefly stopped, and tried a couple of pics. The ostriches are some way away from the road, but they are there; whether for eggs for meat I have no idea. 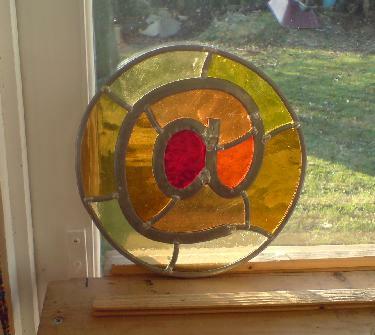 At Christmas I was given a gift of a day’s work at Abinger Stained Glass, and today was the day. I set of with some trepidation, in that the nascently repaired car had not had a full run since the crank TV damper (also known as the pulley) had been replaced. And then the heater disconnected due to the damage done to that by the garage. Huh! So it was a rather cold I who arrived, and was glad to stand in front of the heater for a few minutes. At the workshop, there was Amanda in the teacher role, and the two others on this one day trial, Lisa and Kathy. First job was to decide what to do. I liked many of the numbers but there was no obvious number that would mean something to me. I half joked about a symbol, such as the “@” symbol, but that might make me too much of a geek. Oh no, Amanda said, so we were up and running. The initial idea drawn out. While Lisa and Kathy were doing rectangular pieces, I was on a roundal, which did involve some different techniques. Common to all was to draw the object. 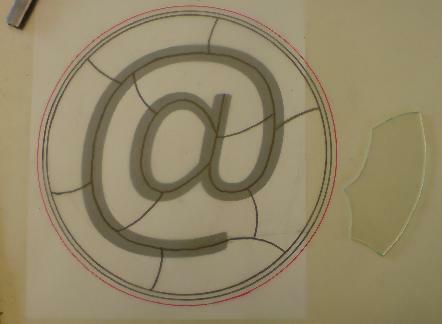 Amanda managed to produce a large scale “@” symbol, which was put into the centre of a circle. A red outer line, a black mid line and a pencil line defined the shape of the of lead around the perimeter. As I was doing a circle, the red and black lines were separate, but for rectangular work, these two lines were close together. 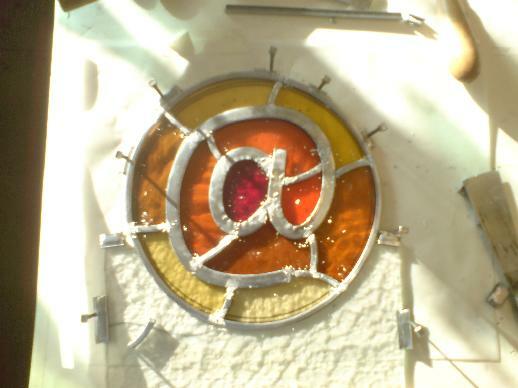 After the outer circle and the shape itself, there then came the defining of the “arbitaries” – the small lead pieces that split the glass up. In my case, it was to graduate the colours, spiraling inwards around the tail of the symbol, and a deep red centre. Again, in my case, the symbol was defined by 1/2″ H lead, and then much smaller 1/4″ H for the arbitaries and the outer circle. The rectangulars had a C shaped lead for the perimeter. Cutting the glass turned out to be fairly straight forward, but I would sometimes have “feathering” or other non-expected splitting along the curves – something obviously for practice. I was also guilty of cutting the glass slightly too big. 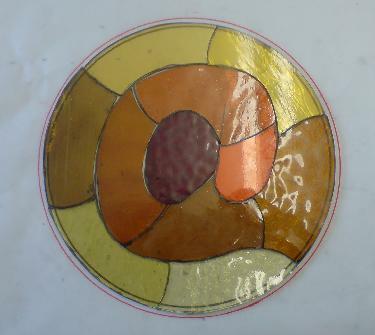 By lunch time all the glass was cut to shape and laid out on the original drawing. 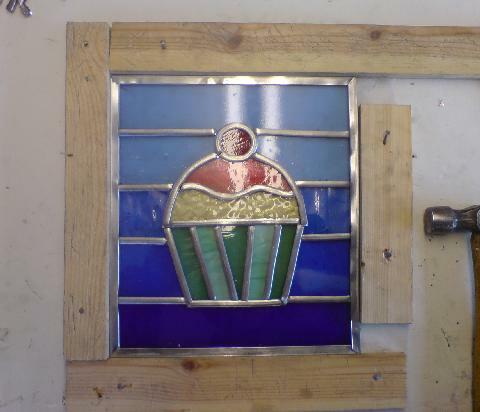 After lunch the lead – and by the way, we were making leaded glass samplers, not stained glass, as we were not processing the glass with metals and other items to “paint” on the glass. 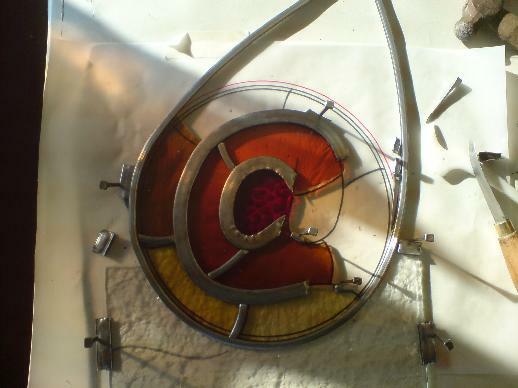 Amanda had to help a fair bit on my sampler – the lead around the red centre was done by her while I was wrestling with the two other parts of the 1/2″ H, and there was more than one occasion when the work had to be almost taken apart so as to add the next of the 11 pieces of glass. Lisa kindly let me take a photo of her job before it was soldered, to show the detail of how a rectangular piece is put together – note how the thin H parts go underneath the edging pieces. 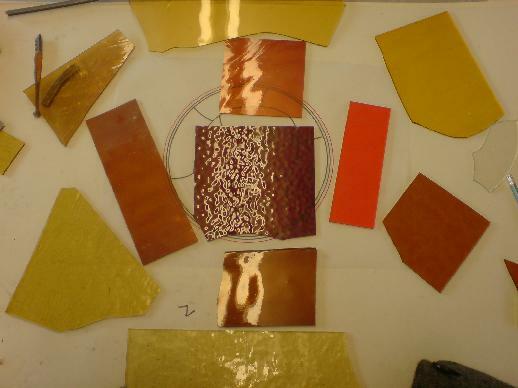 Once the piece was complete, tallow was added to all the joints to be soldered (as a flux). Then the soldering with a gas soldering iron. Here my electronics training came in, as I was used to how solder flows, and on the whole I was able to do this job quite quickly. True I put a hole in the lead at one point, but also was able to cover it up, that even Amanda claimed she was not sure. After soldering on the under side, voila! Can be viewed up to the light. Not yet finished - but can be moved. And, to complete, the gallery of all three. Lisa’s cupcake was a good idea will executed, and Kathy’s colour co-ordination made a delightful collection in blue. The samplers are not yet finished. They need to be cemented, dried, cleaned, then blackened; all of which Amanda does because of the time they take to set/finish between operations. While I was aware that something would be made in the day, it was a still a surprise that from idea to “finished” – something that could be moved around – could be done in a day.